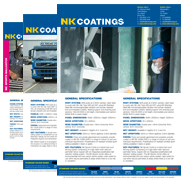 Shotblasting » NK Coatings | The market-leader in metal finishing services in Ireland. Shotblasting is a fast and effective process used to prepare steel surfaces for recoating. Using compressed air, an abrasive material similar to coarse sand is forced through a jet nozzle at close quarters on to the surface of the material to be cleaned. Shotblasting should be used to clean painted, heavily scaled and rusted surfaces – especially before galvanizing. Shotblasting is carried out under the BS 7079 standard. NK Coatings is the the market-leader in metal finishing services in Ireland, based in Mallusk.